These photos were taken in 1972 or ‘73 with an old Polaroid camera. 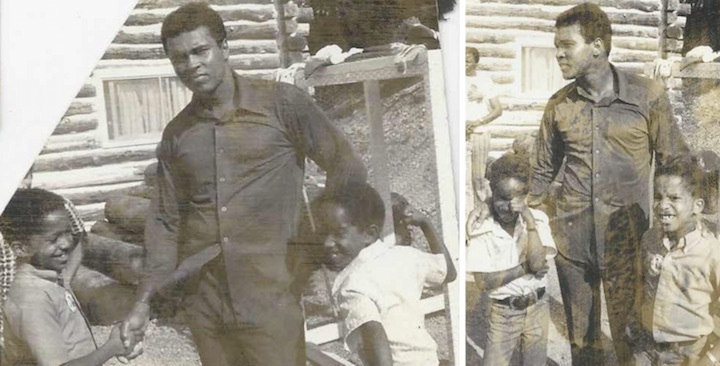 During a family road trip, my parents arranged a visit to Muhammad Ali’s training camp in Deer Lake, Pennsylvania. Dad was a big boxing fan. Mom… tolerated the three males in our household. How fast was Ali in his prime? Very fast. The photo on the left shows Ali evading a punch from my brother, Edward, who was about seven at the time. I distracted the Champ with a handshake. Hightowers always work together. Our family didn’t receive any special treatment from the Champ. As I recall (through the eyes of my eight-year-old self) Ali interacted with everyone in the training camp that day. And I hear that he enjoys people just as much today. There are many reasons to admire Ali. Among them are his discipline, courage, and effective marketing. The fight is won or lost far away from witnesses, long before I dance under those lights. A professional athlete cannot fake preparation. Sometimes the training feels endless. Road work, weights, sparring, and drills are designed to condition the mind and body for combat. Fakers are eliminated early; they never make it to the national stage. Champions have the discipline to train even when they don’t feel like it. Every profession has the equivalent of athletic training. For example, software developers are constantly reading blogs, experimenting with algorithms, and practicing kata. The best entrepreneurs are those who observe human behavior, and they build products and a team to meet customer needs. Sometimes the work feels endless. But champions do it anyway. Champions, in athletics and in business, have the discipline to do what needs to be done even when they don’t feel like doing it. Ali was stripped of his boxing title when he refused to fight in the Vietnam war. He was a conscientious objector. He was arrested and found guilty of draft evasion. Four years after the title was taken, the Supreme Court of the United States overturned the conviction. Ali stuck with his values in spite of the professional cost. His view of the war in Vietnam was ahead of its time. As professionals, how often are we asked to take a stand in the face of personal cost? Ali currently suffers from Parkinson’s disease. It would have been easy for him to lock himself in a room full of money and never interact with people again. However, he chose a different path. Through the Muhammad Ali Parkinson Center he fights for a cure for himself and others. Ali continues to fight. Ali talked trash before and after every fight, taunting his opponents with ridicule and poetry. Ali’s boasting was all about marketing. My father used to say “people like to see a braggart get whupped.” The more Ali boasted, the more tickets the fight promoters could sell and the more Ali could justify big fees for boxing. Privately, Ali shared that he would never let his boasting interfere with his training. In 2011, Ali and my brother met again at the Muhammad Ali Center in Louisville, KY. Edward keeps copies of the 1972 photos on his phone; the Champ enjoyed seeing himself from long ago. 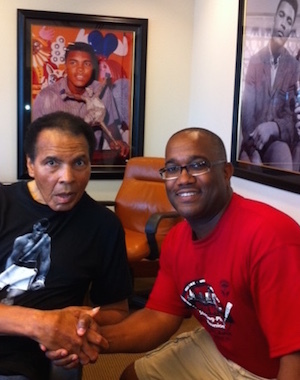 Check out Ali’s t-shirt and the photos on the conference room walls. Ali is always marketing and he loves to interact with people. What a remarkable role model.